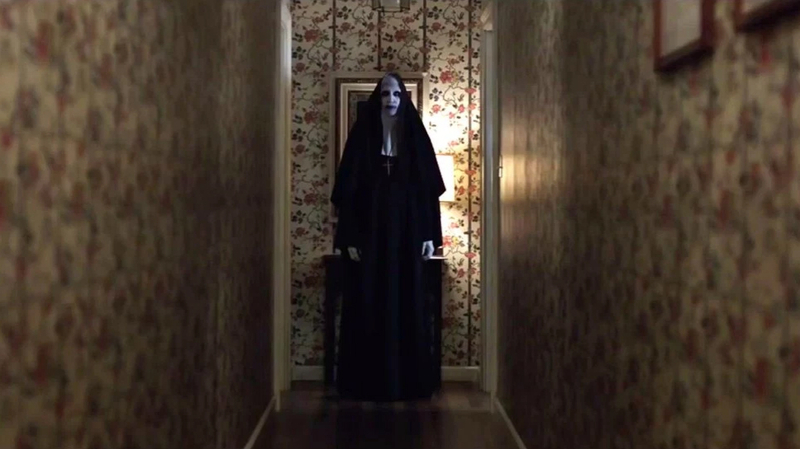 Is this the best that James Wan could conjure up? Lorraine (Vera Farmiga) and Ed Warren (Patrick Wilson) travel to north London to help a single mother raising four children alone in a house plagued by a malicious spirit. I enjoyed the Conjuring. It may have been a little over-hyped BUT it was certainly one of the best horror films I’ve seen in the last decade. I wasn’t surprised to hear that a sequel was in the pipeline BUT after the abysmal Annabelle spin-off, I was anxious to say the least. The first hour was brilliant. It took the same winning formula from the original and perfected it. The tense opening act got the ball rolling as our infamous paranormal investigators took on the Amityville Horror case. Thankfully Wan didn’t focus on that too much BUT it was a nice touch tying it in with the Enfield Haunting. BUT despite the bubbling suspense, I was still a little disappointed that Wan took on Enfield in the first place. Especially when the critically acclaimed TV drama (A must watch) came out earlier this year. It was tough for me NOT to draw comparisons. We all know of the Enfield Haunting to some extent. If you were lucky enough NOT to, then this will freak you out a whole lot more. Luckily Wan provided a creepy new addition for his roster of demented demons. I won’t be looking at nuns in the same way. That’s for sure. Every time she appeared in Farmiga’s dreams, I fidgeting uncomfortably. Nails bitten off. Vera Farmiga was fantastic and carried the film when the pace dragged. The same cannot be said for Patrick Wilson. He was laughable and quite weak this time around. I guess it didn’t help matters that the story revolved primarily around Lorraine and her inner turmoil. Her dealings with the afterlife taking its toll. Madison Wolfe was excellent as Janet Hodgson. Thank God the main child actor delivered because the others certainly didn’t. It was terrible having to listen to a good portion of the supporting cast screeching in horribly mangled “Cockney” accents. Janet’s possession sequences were frightening. That was until the demented host spoke. The ghoul of Bill Wilkins (Bob Adrian) was creepy BUT once he started bellowing like Argus Filch from Harry Potter, it killed all the tension for me. Wan loves to draw out a scene. Playing with the audience. Teasing the tension (aided by Joseph Bishara’s creepy score). The elongated hallway shots. The angles. The suspense as you knew something was going to happen or pop out. For 60 minutes, I was fidgeting uneasily and caught up in it. Something I haven’t been able to do with a horror film in quite some time. BUT something somehow went wrong during the second half of the film. There was a moment where the film changed and lost all the fun for me. Spiralling downhill rapidly. As soon as a neighbour’s Rottweiler morphed into something that looked like Jack Skellington from The Nightmare Before Christmas, my fears subsided as did my patience. The pace dragged putting me into a mini-coma (The 132 minute length really did take the biscuit). BUT the longer it went on, the funnier it got. I would have said that this could have been ripe for a parody BUT by the end, it didn’t need one. It didn’t help having weak characters BUT the performances, my God! Franka Potente (Creep) was completely unnecessary as another paranormal investigator. Talk about too many cooks spoiling the broth. Maria Doyle Kennedy (Orphan Black) was heavily underused in a ridiculous supporting role as a neighbour. Anyone could have played her. Simon McBurney (Rev) was hilarious as paranormal investigator Maurice Grosse for all the wrong reasons. His conversation with a possessed Janet had me in stitches; “No, no, this isn’t your house!” Frances O’Connor (Artificial Intelligence) got on my wick as troubled mother Peggy. There was one scene in particular where she notices a demented corpse creeping towards Ed (Wilson) and what does our bewildered heroine do? Point a flashlight at the thing and say, “”Ere, whose that?”. Bearing in mind, we’ve had 80 minutes of messed up mayhem at this point. Come on! Even the Nun (Bonnie Aarons) got on my nerves by the end. She kept popping up screaming and shrieking every five minutes. I desperately wanted her to go. If Wan could have spend more time on pace, story and character instead of creating creepy new characters with needless spin offs then this would have been worth the hype! BUT the frantic finale dragged its heels and didn’t pay off. Horror films just haven’t been the same in a very long time. Relying on hype and cheap scares. Scariest film of the year? Hell to the no. BUT it’s still the best of the rest. And that’s the biggest scare of all. What’s this, what’s this? (See what I did there). A brilliant Halloween/Christmas film? Or both. Yeah, I’ll get my coat. 24 years? Really? 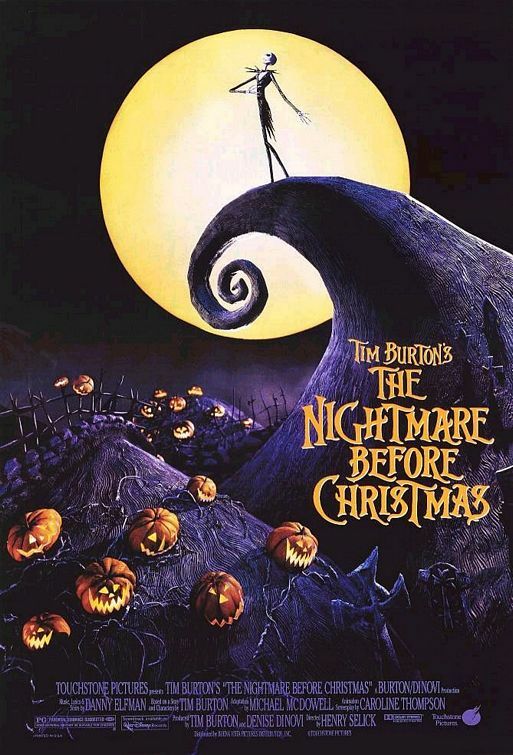 Well, despite that shocking revelation, The Nightmare Before Christmas is still a beautifully creepy, macabre (get me with the fancy words), musical masterpiece that I would happily watch again and again. And again. You get the idea. It had been a while since I last viewed this with the family, but as soon as the opening song began, my feet were tapping and I was singing along, much to my parents’ annoyance. Once I got over the depressing fact that this film is as old as my little bro. Yikes. I’m surprised that the West End or Broadway haven’t adapted this to the stage. I’m sure they did something at Disney for the 20th anniversary? BUT I digress . . .
We join Jack Skellington in the wonderfully gruesome Halloween Town as he battles the growing anxiety that something is missing in his life. Unhappy, he stumbles across doors that open portals to other towns, one being Christmas Town. Elated that he may have found that missing link, Skellington tries to explain the concept of Christmas to the ghastly town with eerily hilarious consequences. A particular highlight being a little boy unwrapping a shrunken head, a very hungry Christmas wreath and toys that don’t quite gasp the concept of “play time”. It may be a little frightening for children of a younger age. Saying that, my brother’s nearly 24 and it still freaks him out! Funny enough, this never did for me. (As a side note, the one that did was Toy Story. I know, right? Sid and Scud scared me and oh God, Babyface. Still shudder now, just typing the name). Understandable that this world could only be brought to the screen by none other than Tim ‘Beetlejuice’ Burton and Henry ‘Coraline’ Selick. BUT the pair fill these delicately creepy characters with such life and heart that make them so funny and entertaining from the delightfully satirical two faced Mayor (Glenn Shadix) to the (appropriately titled) Evil Scientist (William Hickey) with an abnormally sized cranium. Packed with a wonderfully musical soundtrack by, one on the Burton checklist, Danny Elfman (who actually sang for Skellington. Sorry, Chris Sarandon fans). I always use the excuse that this is a seasonal film just to watch it. Well it does feature Halloween, Christmas and Easter (well it’s got the Easter Bunny in it!) and . . . It doesn’t matter a film like this can be watched anytime. Beautifully haunting, great songs, great story, just a great film. Oh, a little parting gift as I can’t get this out of my head now . . .